Developers have had access to iPhone OS iOS 4.0 for a couple months to prepare their apps and help Apple squash bugs. Now, with less than two weeks to go until iOS 4.0 is released to the public on June 21, Apple is allowing developers to submit their updated apps. 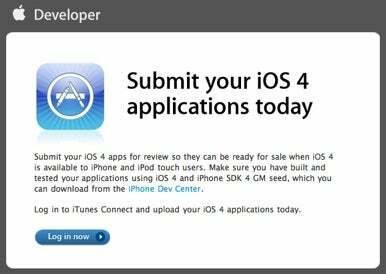 In an e-mail sent to developers and on Apple's developer site, the smartphone purveyor announced that the App Store is now accepting app submissions based on the iOS 4.0 SDK. Though developers have had access to the new OS and its software development kit (SDK) for some time, Apple does not allow currently shipping apps to be based on the new tools until the OS is in the public’s hands. Apple has not yet set a submission deadline, though, for developers who want their iOS 4.0 apps to be ready in the store for launch. For the App Store’s debut on July 11, 2008, Apple’s submission deadline was six days earlier on July 5. For the iPad’s debut on April 3, 2010, Apple’s submission deadline was March 27, seven days earlier.